Diabetes is the number one cause of new blindness in India today. Patients who have diabetes are at greater risk for several different eye problems. They are at greater risk for cataracts, clouding of the vision, clouding of the lens in the eye, glaucoma high pressure in the eye and the most dreaded complication of diabetes is, diabetic retinopathy. This causes the damage to the blood vessels in the retina causing irreversible vision loss. As light rays come into the eyes, through the lens, it lands on the retina to be turned into electrical singles sent to the brain. Arteries and veins take oxygen and brings nutrients to our retina while diabetes damages and destroy these blood vessels. At the initial stage of diabetic retinopathy, a patient may have no symptoms. By the time they start having symptoms it’s already too late because the damage is already extensive. Diabetes is a common disease, and a lot of people affected lose their vision if they are not treated. Untreated diabetic retinopathy is one of the most common causes of blindness. Background retinopathy is the earliest stage of damage to our retina. With uncontrolled diabetes, this can progress to pre-proliferative retinopathy which means the blood vessel damage to the retina is worse. Proliferative diabetic retinopathy is more serious still and can result in you losing your vision. Sometimes as the fluid leaks from the damaged blood vessels, it can also cause diabetic maculopathy. A dilated eye examination by an eye care professional should be part of an annual physical for a diabetic person. Early treatment of diabetes help preserve vision. Treatment of proliferative retinopathy reduces the risk of sight-loss, especially if its given before your vision is affected. 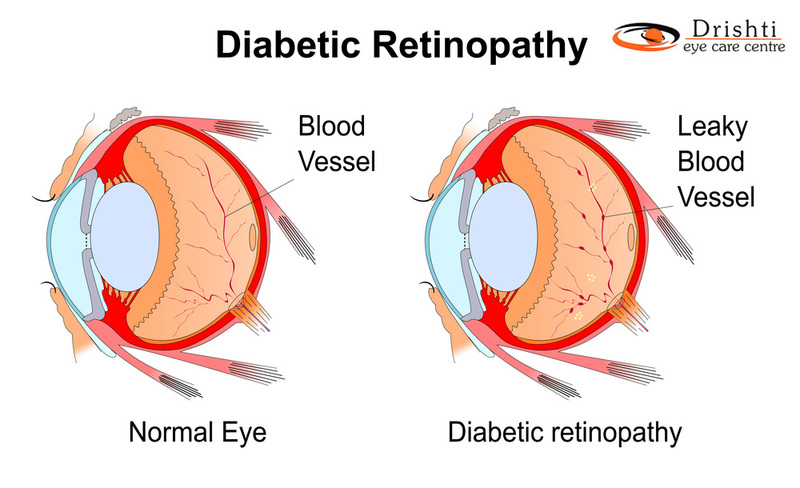 Treatment of diabetic retinopathy could consist of laser treatment, which burns the peripheral retina to preserve the central vision, or injection into the eye to stop fluid from leaking into the retina and damaging it. The problem with diabetic retinopathy is that it doesn’t usually cause sight loss until it reached an advanced stage. Unmonitored, untreated diabetic retinopathy can lead to blindness, so it’s important that you attend all your appointments with your medical team. Controlling your blood sugar level is essential. For every second your blood sugar is out of control, you are causing damage to your blood vessels. the level of fat and cholesterol in your blood also needs to be controlled to protect your arteries and its ties in with controlling your blood pressure. Also, if you smoke, Stop! If you need more information you can contact expert opthomologist at Drishti Eye Care Centre. You can also call on 022 25920606. Next story How to know its time for the Cataract Surgery !